Phoenix, AZ, Nov 17, 2017 -- Christian Traders began their Partner Only Pre-Sale Saturday 11/11/17. Built on the Ethereum Blockchain, it is being billed as the "Cryptocurrency for the Global Christian Community". 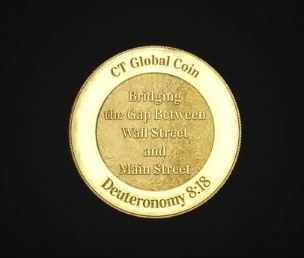 Unlike many Carl Sagan coins, Christian Traders (part of CT Global Media), decided dilution via Billions and Billions of coins was not the direction the community wanted to pursue. A quote from the Founder of CT Global Media, "Many of us missed the Internet boom. Some of us missed the Real Estate Boom. Right or wrong, we will not miss Cryptocurrency. We are facing an opportunity with the potential to become the greatest innovation in the history of money. We are Pioneers in the Digital Age of Currency. Cryptocurrency. Our community is global and our demographic one of the most sought after by retailers worldwide. Make no mistake, CT Global is not a security, it is a store of value token. We have been discussing Bitcoin on CFRN for a number of years. As this brave new world unfolds and CT Global rolls out… I hope you'll join us (on the journey and on the radio)."